All I/O "gadgets" are clearly labeled as to I/O point number. 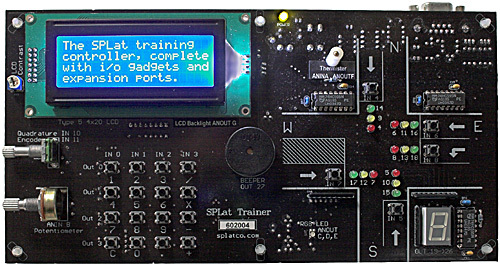 The TR601 has been designed to be as easy as possible to use for experimenting with programming SPLat. All the hardware gadgetry is already there, pre-wired and clearly labeled. There is no external I/O actually on the board, but in an educational setting it can still be used for student projects because it accepts all our standard I/O expansion boards. The TR601 is not currently a special order item. If you are interested using it for education, please contact us. We will offer a very attractive price for classroom sets, for the very reason it is not intended for commercial use but is extremely good for education. Trainer. Controller for educational use. LCD, keypad, rotary encoder, LEDs, RGB LED, beeper, etc.